This scenic ride passes through some of Melbourne’s most historic areas. It goes from Williamstown Station to Macaulay Station. Originally home to the Bunerong and the Woiworung people, Williamstown on Hobsons Bay became the first major port in Melbourne. Built by convict labour, it has a strong maritime history with naval dockyards being built in the 1850s. The first railway line and the first telegraph post in Melbourne were here. As you ride through this suburb notice the old buildings juxtaposed with new development. Continuing up the coast around Hobsons Bay and along the Yarra River, you reach the Westgate Bridge. Take a moment to contemplate the memorial to the 35 lives lost when the bridge (under construction at the time) collapsed on 15 October 1970. The ride then takes you to the very scenic and beautifully serene Maribyrnong River. Maribyrnong comes from the Aboriginal “Mirring-gnay-bir-nong”, which translates as “I can hear a ringtail possum”. Heading north you pass Footscray, originally called Saltwater, where a punt once connected the western suburbs to the centre of Melbourne. This area, once the industrial hub of Melbourne, became home to migrants from the 1950s. Crossing the Maribyrnong River to Kensington, you can see Flemington Racetrack in the distance, home to racing since 1840, the oldest racetrack in Victoria. Then you enter the Newmarket Saleyards and Abbatoirs, now a rather lovely landscaped mixed housing estate. You will see old bluestone cobblestones and old fences left in place. Under Epsom Road there is a fascinating display of mosaic murals celebrating the rich history of the saleyards. Part of the challenge of this ride is negotiating your way through the complex web of streets and paths of the redeveloped saleyards. Don’t worry if you lose your way – it’s all part of the fun. Just do not exit onto Racecourse Road. There are cafes and toilets at the start of the ride in Williamstown, and cafes in Kensington near the station. There are toilets in Yarraville Gardens. The route is mostly along bike paths and is almost all flat. There is just one very short climb. Start at Williamstown Station and ride along Ann Street to Nelson Place. Cross Nelson Place and turn left along the footpath that is Bay Trail West, a shared bike and pedestrian path. Follow Bay Trail West as it goes parallel to Nelson Place and The Strand, passing Sandy Point. At the end of The Strand pass to the left of HMAS Yarra National Memorial and turn right to ride along the footpath to the end of the carpark where Bay Trail West continues. Turn left on the trail and ride past the Newport power station and the historic MMBW pumping station (notice the pipes) to reach the Westgate Bridge. Ride straight ahead under the Westgate Bridge. On your right you will see the memorial to those who lost their lives in the Westgate Bridge collapse. Cross Stony Creek and pass the only mangroves in Melbourne. The trail now continues north along a shared footpath on the right side of Hyde Street. At Somerville Road, opposite the Yarraville Gardens, do not cross the road but turn right along Somerville Road to stay on the shared footpath. Cross Whitehall Street and turn left to travel north along the shared footpath on the right side of Whitehall Street. At Lyons Street, turn right away from Whitehall Street, and follow a path alongside a canal to the Maribyrnong River. At Maribyrnong River, turn left and follow the path along the river as it passes under Footscray Road and then, Dynan Road. 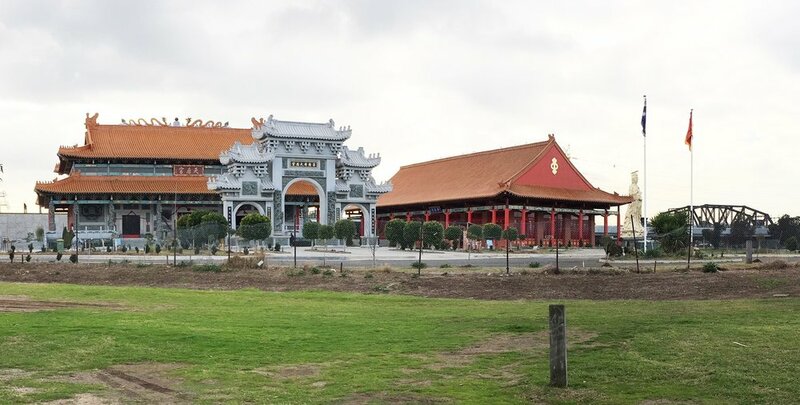 On the left you will see the Heavenly Queen temple and statue. Just after the temple you pass under a railway bridge. About 200 metres after the railway bridge, with Newells Paddock Wetland Park on your left, you reach a pedestrian bridge across the river. Pass under the pedestrian bridge to turn left on the ramp up to the bridge and cross the river. Continue straight ahead to enter the old Newmarket Saleyards. Ride as straight ahead as possible until you see an uphill road ahead. Here veer left to stay on the bike trail and pass under Epsom Road. Turn right immediately onto a path that continues into Drury Lane. Take the second left into Siberia Lane. Take the second left into Siberia Lane and then the first right into Liddy Street. Turn left into Market Street. After a block you reach McCracken Street. Turn right into McCracken Street and then immediately turn left into Anthony Street across a car barrier. Ride to the end of Anthony Street, where you meet Bellair Street, which follows the railway embankment opposite, and turn right into Bellair Street. Turn right into Bellair Street. After 1.5 blocks turn left to cross underneath the railway line and immediately turn right onto the shared path alongside Eastwood Street, following the railway line. Follow the shared path to Kensington Railway Station. Sandy Point: Pass through the gate on the right of the trail and explore this by bike or by foot. Mangroves in Stony Creek Park near the Westgate Bridge: This is a short foot excursion on the right of the trail. At the end of the ride follow Eastwood Street across Macaulay Road for one block. Then turn left into Little Hardiman Street. Turn right into Macaulay Road and use the footpath to ride across the creek where you will find the Capital City Trail underneath the freeway. Turn right to go into the city. Turn left to go towards Royal Park. Please click on box with arrow at top left corner to see the map legend. Please click on box at top right corner to see the map in Google Maps. You must be logged into Google Maps to do this. Note that at the purple stars the Google route looks like it is on the road, but be assured that it is in fact along shared paths next to the road.